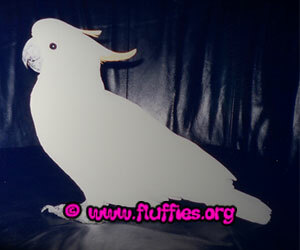 Some time ago I had a citron crested cockatoo (cacatua sulphurea citrinocristata) named Misty. She was a real sweety and she didn't scream much. She was around a half year old when she got here. She didn't talk but I didn't care about that: She had so many other things that made her special. I used to call her 'Mistymeid' which means something like Mistygirl. 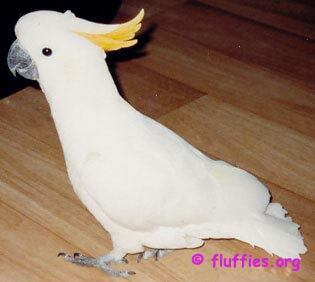 When I was vaccuumcleaning she used to pull her beak to the bars and I let her play with the vaccuumcleaner. When I was about to leave I always scratched her through the bars and she grabbed my finger if she got the chance. She would hold it very tightly as if she'd say: "Don't go!" When I visited my parents she always got a treat from my mom and after some time Misty knew where the treats came from. She followed my mom to the kitchen and softly banged her beak on the refridgerator-door. She then went to my mom and pulled my mom's jeans with her feet! She continued this as many times as was necessary for my mom to figure out what she wanted: TREATS! She broke out because I underestimated her intelligence. I let the key in the lock as I thought she couldn't turn the key. Well, she could! First I didn't believe it and left the key in the lock. But one time I saw her being busy with the key and I had to face that she was extremely clever. It cost me my table and she perforated my couch, but ah, it was my fault underestimating her! I still miss her very much, and this page is dedicated to her so that she won't be forgotten. On february 1st 2005 I added these old photos..